Is Ted Cruz Hispanic? Is Marco Rubio Latino? Journalists and voters alike have had a tough time navigating the various ethnic identity labels during the 2016 presidential race. (Not NPR’s Lourdes Garcia-Navarro, she gets it). So have the candidates. Texas Sen. Ted Cruz, whose father is Cuban, turns his latinidad up and down like a dial. Rubio, by contrast, has worn his Cubano heart on his sleeve. The Senators’ strategies will come to bear in Nevada next week, where Cruz and Rubio compete for a large portion (analyst say about 20 percent) of Hispanic caucus goers. What makes these candidate seem more or less “Latino?” How much does it play into their electability? These subjective impressions are already a part of the political reality of 2016. Take the influential Latino Victory Fund . None of their candidates are Cuban-American, and most are liberals. Despite the mission to elect “the first Latino president,” the political action group has railed against Rubio and Cruz. In fact, before we had finished this article, Latino Victory had endorsed Hillary Clinton. As comedian Al Madrigal pointed out at the beginning of Marco Rubio’s campaign, there’s a difference between being Latino and being Latino . Confused? Here are four things about “being Latino” to keep in mind ahead of the Nevada caucuses, listed in order of how interesting I think they are -- not necessarily how important they are. One thing to note, every individual mentioned in this article (except for Jeb Bush and Martin O’Malley) are Latino and Hispanic, so we’re using both terms interchangeably. Along the way, we’ll list some curious exceptions that attack the premise of these loose definitions. Candidates with Latin American heritage are often lumped into oversized category of “Latino.” Cruz and Rubio’s Cuban-American background might give them something in common with Nuyorican and Mexican-American immigrants: Spanish spoken at home, parents who struggled to assimilate in a new place. But when it comes to immigration, Rubio and Cruz have less in common with Mexican-Americans and more with Puerto Ricans. Hundreds of thousands of Hispanic voters will take a surname seriously when the go to the ballot on November. I hadn’t thought of this until I heard Ruben Navarette Jr. tell a crowd that his father, a Democrat, would probably vote for Ted Cruz if he saw his name on the ballot. (Further reading: Why Aren’t Marco Rubio and Ted Cruz Hispanic Enough for Whites? ) Think about it: in elections where president’s differ little on policies, the look of a face and the sound of a name are a serious factor. Raul Castro. Now that’s a Hispanic name (and, coincidentally, the name of Arizona’s first and only Latino governor ). Marco Rubio. Pretty Hispanic. Ted Cruz, a little less, but it didn’t get in Brian Sandoval’s way . Plus there’s empirical evidence that he can boost the Hispanic vote (though he’d probably get a bigger bump with his birth name, Rafael ). Donald Trump? Forget about it. Curious case: What if it were Ted Cruz’s mother who was Cubana and his dad was named something like McCormick? Latinos support pro-immigrant policies more than any other ethnic group. Because of this, immigration advocates and activist Latino groups (usually with a Mexican or Central American focus) often dismiss the idea that Rubio and Cruz are “Latino candidates.” This is not a new problem for the presidential hopefuls. Barack Obama faced criticism during his candidacy for not being “black enough” on issues such as affirmative action and racially biased policing. The reality immigration is not the most important issue for Hispanic voters. In fact when polled, Hispanic voters almost always rank the economy, education and healthcare as the policy areas they care most about. At the same time, Latinos are less likely to agree on the solutions to those issues then the would on immigration. So what defines a Latino candidate’s platform is up for debate. Unlike African-American candidates, Latino candidates face a linguistic litmus test. 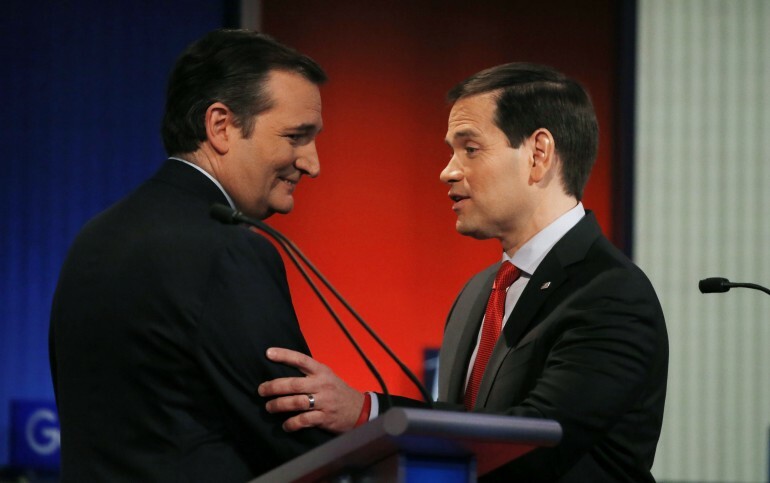 As the testy exchange in last week’s GOP debate showed, it's a huge factor in establishing their Latino chops. Rubio speaks Spanish at a native level, giving him huge exposure on Latino-focused news networks. As a New Mexico native, I’ve seen public officials struggle to use Spanish in public settings. Former Governor Bill Richardson spoke Spanish well. Other Hispanic public official (including some in office now) do not. Curious case : Jeb Bush speak Spanish perhaps even better that Julian Castro, the second-generation Mexican-American immigrant who is on Hillary Clinton’s shortlist for vice president. Who will seem “more Latino” to Hispanic voters if the two faced off in a general election? What defines a Latino candidate for you? Please join the conversation in the comments below.